Daikon is widely available in the US market now. But it is still a mysterious ingredient for many people. Daikon ("large root" in Japanese) is a white root vegetable from the radish family. Compared to other root vegetables, daikon has a high water content and is therefore very juicy. Your can eat it raw (especially good in a salad), grate it and add to tempura sauce or salad dressing, braise them in a sweet soy broth or make a soup. Here, I introduce you to a simpler way of eating daikon: daikon steak. Cut daikon into four equal pieces (1-1/2" each). Peal the skin as thinly as possible. 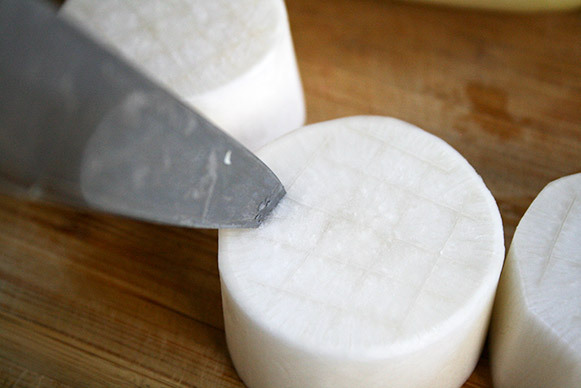 Then, use a paring knife to make a criss cross pattern on both sides of the daikon. Place them in a microwave safe dish and cover with plastic wrap. Microwave for about 4	minutes	or until daikon is tender. In a small fry pan, heat oil and sliced garlic over medium heat. Cook until the garlic is golden brown and then remove from the oil with a slotted spoon. Set it aside. In the same pan with the garlic infused oil still inside, place the daikon. Salt and pepper the daikon. Cover and cook it on medium heat for 3 minutes. Flip, salt and pepper again, and cook another 3 minutes. Turn the heat down very low and put on the butter and soy sauce. Flip daikon once to coat with the soy butter sauce. Turn off the heat before the sauce has evaporated. Add more soy sauce if needed. Plate daikon and pour the sauce over. 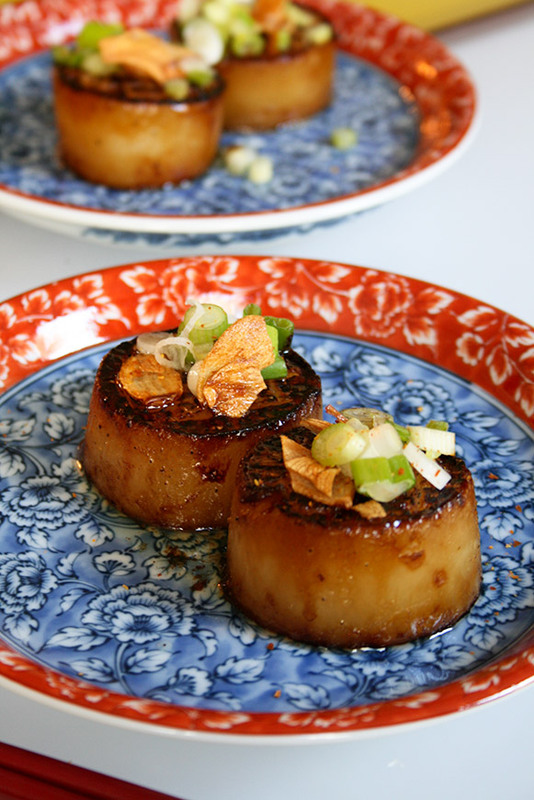 Garnish with scallion, garlic chips and ichimi.